Do you read Hayefield? I came late to discovering Nan Ondra's site so I've had the pleasure of losing myself for hours in the archives. She's been doing a series on annual events, which have been nothing short of inspiring. Like any normal person, I sometimes become irrationally obsessed with a plant and I need to have it. This has been the case this year with Daphne x transatlantica 'Everblooming Alba', then later with Chionochloa rubra. The other plant that's been sitting in the back of my head is a coreopsis I saw on Nan's site, 'Limerock Ruby.' You can see a photo of it here. It has beautiful wine colored blooms and Nan pairs them with both dark purple foliage and orange(!) blooms. I called around and couldn't find anyone local who carried it. 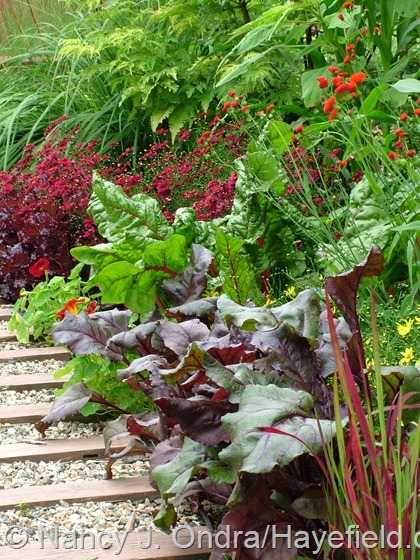 I searched online and found one single seller, Gorge Top Gardens. I'd never heard of them, which made me a little nervous. I haven't done enough plant buying online to know who's good and who's not. They were on sale for $3.99 so I decided to buy seven of them. Seven! I have a big yard but I'm not really sure what I was thinking. Actually, I know what I was thinking: flat-fee shipping, might as well reach for the stars. I can do two plantings of three and give one to Scott. It took a week for the plants to arrive after shipping, and they were smooshed down with newspaper, plopped unceremoniously into a plastic bag. The plants were very unhappy. I was less than impressed. But coreopsis are tough and they are all perked up again, so I think we're going to be just fine. I've gotten used to ordering from Annie's and they pack their plants so beautifully; I sort of expect that from everyone now. Of course, the delivery guy always ignores the THIS SIDE UP message and parks them on my doorstep in blatant disregard for the arrow. It drives me crazy. Are there any online nurseries that you absolutely avoid? I've been waiting for-f*cking-ever on a shipment from High Country Gardens and it's making me so impatient. Good thing I've got all this coreopsis to keep me busy. I have only once ordered from High Country Gardens, and the resulting miniscule plants at top-drawer prices put me off doing it again. I WANTED to like them and their stock, but two of five died right away, so it's not looking hopeful. YES! That's awesome, I've been looking for those all over...and with no luck! So far, I've only had good experiences with mail-order (from HCG, Forest Farm, Annies and Garden Crossings). Your recent experience with HCG makes me nervous, though, they used to be extremely prompt about delivering on the date you specified when you ordered. True, the plants are pretty spindly and sad-looking when I get them, but I've never had one die...yet. How I loved Limerock Ruby! The pretty coreopsis did not love me back and it only lasted one season. I have had terrible luck with coreopsis cultivars, I don't think they really are hardy enough in northern CT, despite being marketed here, and none of my fancy ones ever survived (the big yellow native ones do fine). You should be able to keep them much happier in your climate. I'll have to come to your blog to see their pretty blooms since I no longer grow any. I hope it survives the winter here--it sounds like the wimpiest of all the coreopsis. I avoid Whiteflower Farms. They have good plants, but they are very overpriced. I'm with you. Glad you refered to us as 'normal'. I'm currently glutting on plants in anticipation of pulling up the lawn and planting that sucker up. Thanks to Scott and Nan I have too many new plant obsessions to list. Love your blog lady. How exciting to find a plant after which you've lusted! Thanks for the heads up about Hayfield; I look forward to reading more of that blog! I've found the comments of customers of mail order nurseries on Dave's Garden (www.davesgarden.com) to be helpful in deciding about places to avoid. How exciting to find a plant after which you've lusted! Thanks for the heads-up about Hayfield; I 'm lookiing forward to reading more of that blog! The cusomer comments about various mail order nurseries at www.davesgarden.com have been helpful to me in deciding where to avoid. I used to buy my relatively pricey stock of yearly seeds from Territorial Seed, because they often have cool veggies I can't find elsewhere, but this season I was SO FRUSTRATED at their outrageous shipping prices that I decided I was done. The shipping seemed high for my initial order of just over a dozen seed packets and two or three live plants, so I removed the live plants -- no change. So I only picked out the things that they alone sell. I would have had to pay $7.50 to ship a $2.50 pack of seeds. NOPE. Ugh, that's egregious! Are you growing anything cool this year? Bulbs are pretty much the only things I mail order after being burnt by High Country and several others. I'm an impulse buyer, so I just cruise our wonderful local nurseries and come home sated.